The San Francisco Bay Area’s rapid transit system took a big step towards ensuring a clean energy future, and it’s using wind power to get there. The Bay Area Rapid Transit (BART)’s Board of Directors approved two 20-year power purchase agreements (PPAs) last week, one for 61.7 megawatts (MW) of wind and one for 45 MW of solar. When delivery begins under the contracts in 2021, renewable energy will jump from 4 percent to 90 percent of the District’s electricity portfolio. As a result of these purchases, BART will save nearly $174 million over the two-decade contract terms. BART’s announcement is yet another example of how wind energy is a win-win, allowing purchasers to save money even as they reduce air pollution. As a public transportation system serving around 423,000 passengers every weekday, BART is one of the largest electricity consumers in Northern California. Today’s news will ensure that electricity is coming from clean, renewable sources. At a time when transportation accounts for more carbon pollution than any other sector, BART’s wind energy purchase is a hallmark of how transit systems can take concrete steps to reduce environmental impacts that make good business sense, too. AWEA is keeping track of all the good news on the non-utility purchasing front. 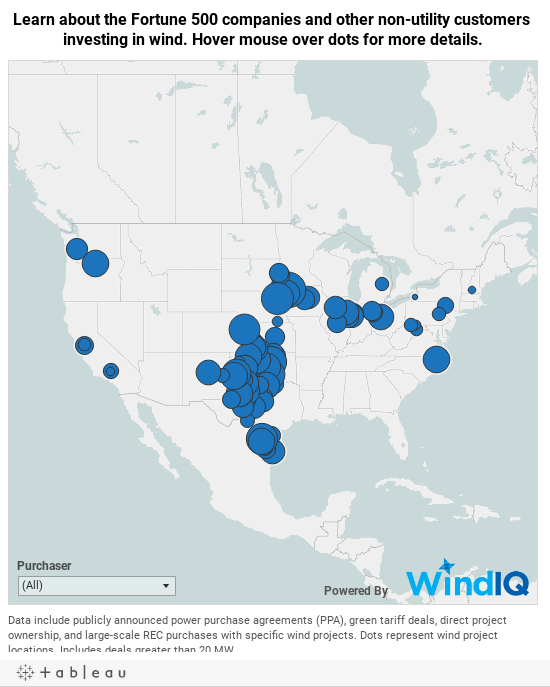 Below is a new interactive map that includes all publicly announced non-utility wind PPAs at least 20 MW in size. You can also view the map anytime here.